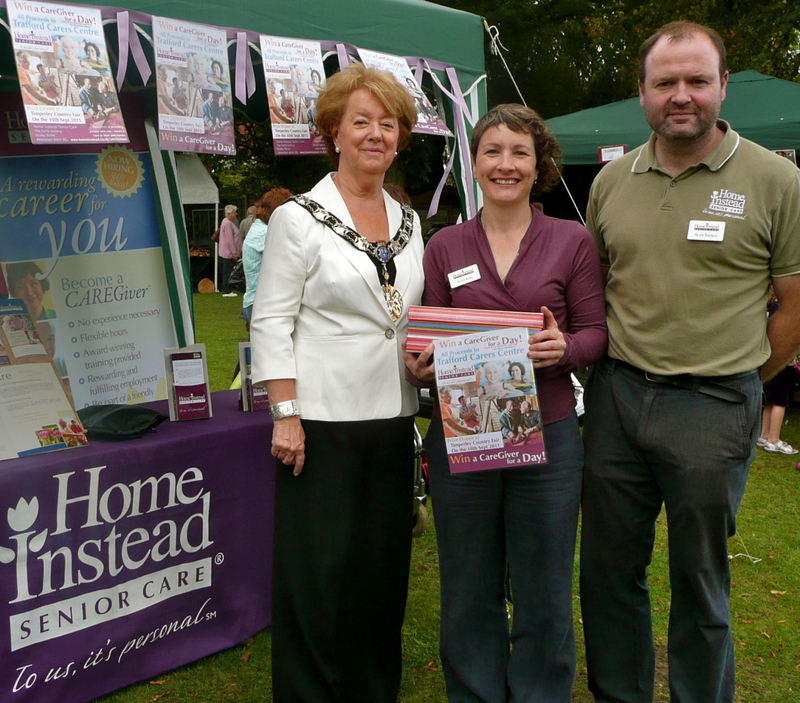 Owners of Home Instead Senior Care Altrincham, Alan Savage and Lucy Gill, were congratulated by the Mayor of Trafford, Jane Baugh at the recent Annual Timperley Country Fair. The Mayor was impressed with the pair’s fundraising efforts for Trafford Carers Centre, which happens to be one of the Mayor’s chosen Charities of 2011. Lucy has worked hard throughout the summer promoting the carers centre and the important work that they do supporting family carers in the area, by speaking with local groups throughout South Trafford. She has received much enthusiastic support and has successfully raised £350 for the charity. Home Instead Senior Care is rapidly building a reputation as one of the UK’s leading care companies. Its service is tailored to the needs of individual clients and ranges from companionship, meal preparation, light housekeeping, post-discharge care, personal care, medication reminders, shopping and errands. Help is available 24 hours a day, seven days a week. If you would like more information about the care that Home Instead provides, call 0161 870 1136 or visit www.homeinstead.co.uk/Altrincham. Photo caption: (left to right) Mayor of Trafford, Jane Baugh, Lucy Gill and Alan Savage.